I need to create an object mesh with two sets of UV map coordinates. On the first uv map layer I want to have a base material that I can tile as much as I wish and the second uv map would cover all of the object without repetition. Imagine a wall where a plaster texture repeats itself all over the wall, but there is also a second coat of grime and dirt texture that extends the whole wall and doesn't tile. I followed the answer on this thread (http://blender.stackexchange.com/questions/24398/map-multiple-textures-to-a-face-individually#new-answer?newreg=38af727ccc0f455bbbefac6034a2aad3) to assign multiple textures layers to the same mesh. I know this will increase draw calls but that is not important for what i'm doing. The problem is when I export to fbx, or even load the blend file in unity the mesh only has one material. 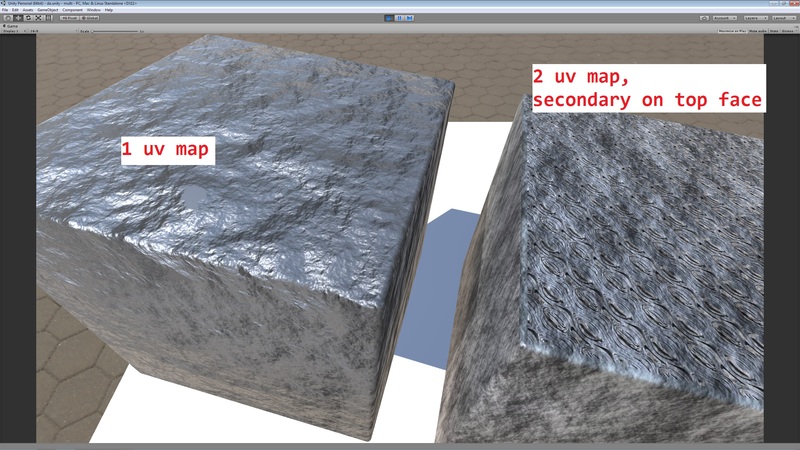 How can I export the mesh so that Unity knows that the mesh has two materials and two sets of UV coordinates?